The Pennsylvania State Quarter was the second quarter issued under the 50 States Commemorative Coin Program Act and the second quarter issued in 1999. The statue "Commonwealth," is a 14' 6" statue of a woman that tops Pennsylvania's state capitol dome in Harrisburg, Pennsylvania. She has held her lofty perch since May 25, 1905 with her right arm extending in kindness and her left arm grasping a ribbon mace to symbolize justice. The bronze-gilded statue was designed by New York sculptor Roland Hinton Perry. Ever since Pennsylvania was toasted as "the keystone in the federal union" at a Jefferson Republican victory rally in October 1802, Pennsylvania has been known as "The Keystone State." This is why the keystone image was chosen as one of the elements of the design. A Commemorative Quarter Committee consisting of representatives from major cultural, conservation, travel, and tourism organizations; a teacher; a high school student; the president of the state Numismatic Society; and the state treasurer was chosen to review designs for the new Pennsylvania quarter. Citizens of the state contributed 5,300 ideas for the design. The 14-member Commemorative Quarter Committee narrowed these down to five designs which the governor submitted to the United States Mint. From the four designs that were approved by the Secretary of the Treasury, the governor chose the final design. 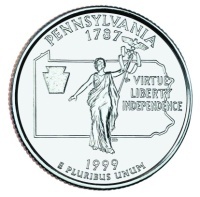 Below is a table showing the design specifications and mintages of the Pennsylvania Quarter. Note: The modification moved some of the wording from the reverse to the obverse to leave the reverse available for the state's design. Reverse - Each state theme was proposed, and approved, by the governor of the state. Final design was created by John Mercanti. His initials appear to the right of Commonwealth near the bottom.